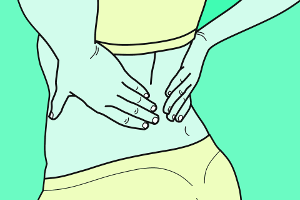 Acupuncture for the treatment of chronic lower back pain. Chronic pain is pain that has existed for 3 months or more. It can be initiated by trauma, and becomes chronic if it persists after the acute symptoms of inflammation and swelling have resolved. Pain can seem to get stuck in an area. Sometimes (and particularly frustratingly) chronic pain occurs with no apparent cause. Chronic backache frequently occurs in people with sedentary jobs and is also common during times of stress. The pain can in turn lead to poor sleep, exhaustion and further stress. Acupuncture has been shown to stimulate nerves and connective tissue and areas of the brain associated with pain regulation. This can improve the body’s healing ability by stimulating production of natural painkilling chemicals and creating a feeling of relaxation and wellbeing. There is strong evidence supporting the effectiveness of acupuncture for chronic lower back pain. At Islington Acupuncture we use a combination of massage and acupuncture to help relieve your pain. The nature of long-term pain is that it can be resistant to quick fixes, but we would expect you to notice some improvement within three treatments. This video was made in the US, but the information it contains is relevant in the UK.